In 1976, at the age of seventeen, John became a professional golfer at the RAC Country Club in Epsom. For three years he practiced every hour available. In the mornings he couldn’t wait for the sun to rise so he could start hitting balls, after work he would practice until sunset. His hands bled, he literally wore out golf clubs, but after thousands of hours of dedicated work he took his tournament players card and qualified to play the European Tour. Like any young man setting out on a thrilling adventure, John was incredibly excited to be going abroad to play the first five events of the 1979 European Tour, but when he got to the airport and saw the players he was expected to compete against, his confidence nose dived. There was no way he felt ready to play in the same field as Sir Nick Faldo, Seve Ballesteros and Ian Woosnam. With his confidence in tatters he took an absolute hammering and consequently came nearly last in every event. Determined to find a way to succeed, he set about learning from his mistakes. From 1979 to 1983 he went in search of a golf swing he could trust, trying every conceivable theory. Eventually he found a way to draw the ball in a left to right wind – something that had let him down in the past. He developed a putting stroke he could count on and he started to think clearly under pressure. In 1985, after a good finish in the PGA Championships at Wentworth, he won the first European Tour ‘Shooting Start Award’ for the most improved order of merit position. It had taken a long time, many tears and much sweat, but he could finally hold up his head in the company of his fellow professionals. But playing tournament golf for a living is pretty tough and looking for an opportunity to stabilise his life, he accepted the job as club professional at West Surrey Golf Club. It was a marvellous place, offering new opportunities, and for a number of years he concentrated on his teaching skills. He taught several very good players which gave him tremendous fulfilment. Ironically, his more relaxed approach on the course led to even greater tournament success. Eventually, he went on to lead England in the European Team Championships and twice represented Europe in the PGA Cup matches against the USA. In 1991 he had the thrill of playing all four rounds in the Open Championship at Royal Birkdale and in 1992 he won the club pros grand slam, including the British PGA Professional Championships. As a highly respected professional he was elected Surrey PGA Captain. 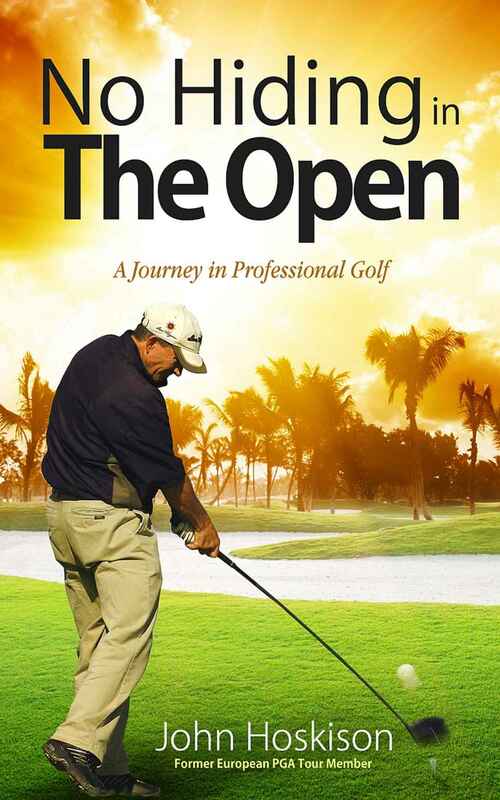 "No Hiding in The Open - A Journey in Professional Golf" - Out Now. 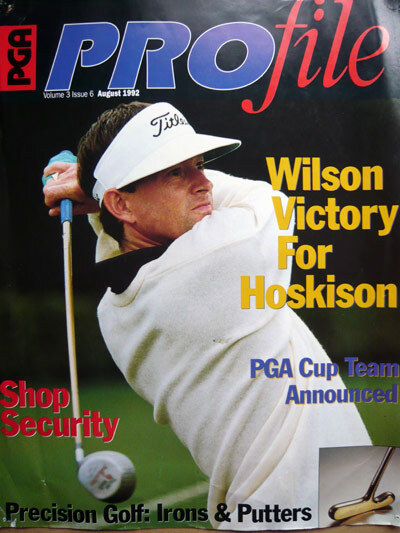 John Hoskison dreams of making it as a successful golf pro on the European PGA Tour. When he meets Seve Ballesteros for the first time and makes the cut in the Martini International, he looks set for success. Then reality kicks in at Royal Birkdale in the PGA Championships. For more information see the Golf Books page. In 1994 however, he shattered the idyllic life he had forged. On a November evening he broke a discipline he had maintained for twenty years and accepted a drink after a golf match before driving home. On his journey home he hit and killed a cyclist and was sentenced to three years in prison. In the blink of an eye everything John knew was shattered. After three months of dreadful regret and remorse he received a letter from the widow in which she offered him the most incredible Christian-like forgiveness. She hoped that somehow he would survive prison. Without that forgiveness, by John’s own admission, it is doubtful he would be here today. John was shocked by what he found in prison. Not by the toughness of it, he welcomed the punishment. What he found incredible was the amount of drugs pouring into prison and the inevitable violence that heroin causes. During his time inside John wrote a book detailing what he discovered about the penal system. The book was very well received by everybody who read it including Lord Ramsbotham, (Chief Inspector of Prisons), who said it should be mandatory reading for anyone working in the prison system. For the last fifteen years John has tried to make up for what happened. He has spoken at over 200 schools, to over 80,000 children, about the dangers of taking unnecessary risks. He has also attended many conferences about how to improve prison and has spoken to many of the top judges in the country, regularly attending the Judicial Studies Board Seminars. After many years in the darkness, in 2007, with the blessing of everyone concerned, he took his European Seniors Tour Card and incredibly finished 2nd to gain full playing privileges. For two years he played extensively throughout Europe on the Seniors Tour. However, not wanting to turn his back on warning young people about making the wrong choices in life, he continues to speak at many schools. Recently he has finished his first fictional novel, called Name and Number, which became a bestseller and reached number 2 in the Amazon literary charts. He is currently writing a sequel. Incredibly, after a year off from playing golf due to injury, he entered the 2012 British Seniors PGA Professional Championships and finished 3rd. For the last few years John has also been junior organiser at Newbury Golf Centre where he has tried to encourage as many youngsters as possible to play golf. During that time he became the chief golf writer for Suite101, where his articles have been read by over 1,000,000 people. Copyright John Hoskison 2017. Created by JLHoskison.